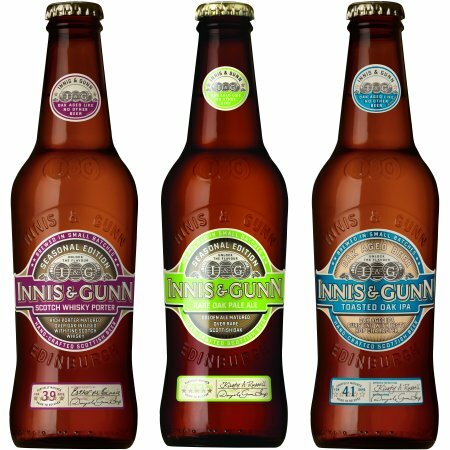 TORONTO, ON – The Canadian office of Scotland’s Innis & Gunn has announced details of its release plans for autumn and the holiday season, including a new year-round product, several limited edition releases, and the 2014 edition of the always anticipated I&G holiday gift pack. Toasted Oak IPA – the newest addition to the core Innis & Gunn range – is a 5.6% abv ale described as a “well-balanced triple-hop-infused brew matured for 41 days over oak, giving it a rich, rounded quality much like an authentic IPA of the 1800s”. Available now in six-packs in Alberta and New Brunswick, and in individual bottles in British Columbia, it will also be included in the gift pack described below. First up on the limited edition seasonal front is Rare Oak Pale Ale, a 5.8% abv ale aged over Scottish oak, and flavoured with elderflower and sweet gale along with Super Styrian and Whitbread Golding hops. The resulting “crisp, aromatic and light” beer is available now in Alberta, British Columbia, Manitoba, New Brunswick, Newfoundland and Saskatchewan, and will be released in Ontario in mid-November. Last but not least, the Innis & Gunn Gift Pack 2014 will arrive on shelves in time for holiday shopping, and will feature 330 ml bottles of four brands – Innis & Gunn Original, Toasted Oak IPA, Rum Finish and Bourbon Stout. Distribution is planned for Alberta, British Columbia, Manitoba, New Brunswick, Newfoundland, Nova Scotia, Ontario, PEI and Saskatchewan, with prices starting at $14.95. I am certainly happy to see the return of Bourbon Stout this year, but would it not make sense to include Scotch Whisky Porter in the 2014 Holiday Gift Pack as well? I understand the inclusion of Orignal because it’s the flagship beer of the company, but Rum Finish? In the Gift Pack? This is a disappointment. And the new Toasted Oak IPA doesn’t belong in there, either, after having been featured in the Summer Gift Pack. And is there no glass included this year? It just seems to me as though the Winter seasonal Gift Pack should have Innis & Gunn’s winter seasonal beer, Scotch Whisky Porter, included. Any update on when BM Reserve will be available? How can I pre-order some? Still waiting for the Barrelmaster’s Reserve: Highland Cask to make an appearance at the LCBO… any idea when this will happen?